My brain is full! I just finished two amazing days of PD with about 30 educators in my district. I promised I’d blog about it, and I need to because I just have so much going on in my head right now. Like I said, my brain is full! 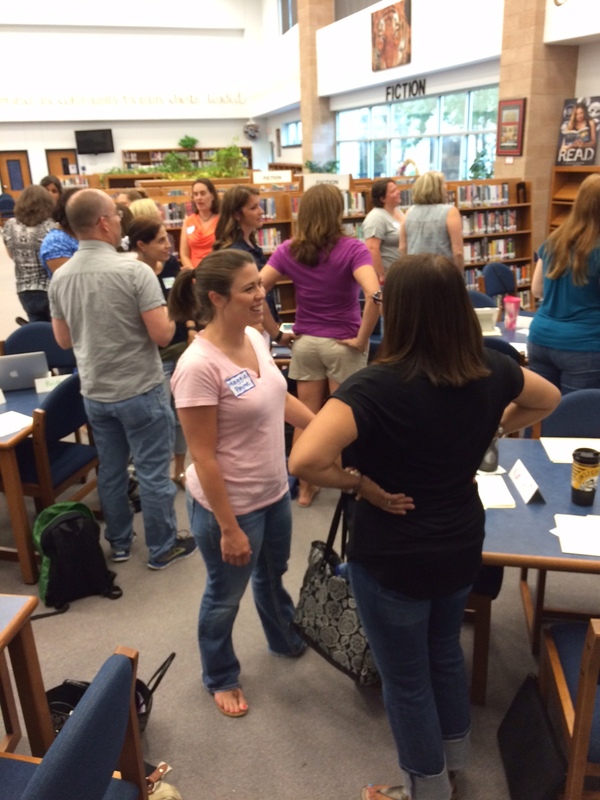 This school year, I’m leading an advanced course with elementary teachers in my district. I didn’t really have any guidance beyond that, so it was left to me and my co-worker Regina to set some goals and make a plan. All we started with was a name: Math Rocks. And that’s only because our district already offers an advanced course called Reading Rocks. Back in May, Regina and I put together an application and asked teachers to apply for this course that has never existed before. Amazingly enough, about 36 people took the time to apply. We read through their applications and selected 24 educators to be in our inaugural class. What I like about it is that we have a wide variety of folks – general education teachers K-5, a few instructional coaches, a TAG teacher, and a few interventionists. And within that group we have dual language teachers and inclusion teachers. They are so diverse; I’m excited about the varied perspectives they’ll bring to our work. We kicked off the course yesterday and today. We’ll continue our work online for the next month before school starts. Once the school year begins, we’ll meet every other Thursday after school throughout the fall semester. We’ll continue into the spring semester with a final meeting in early February. It’s going to be awesome! But let’s get back to the first two days. This is the most we’ll ever be together in one place: 12 intense hours across two days. We opened the first day with a little estimation from Andrew Stadel’s Estimation 180. We of course did the task that started it all: How tall is Mr. Stadel? Which process standards did you use? This was a great way to get everyone up and moving at 8:30 in the morning, but it also started something they weren’t going to be aware of immediately. One thing I did very intentionally throughout the two days was embed FREE resources from my online PLC, the Math Twitter Blogosphere (MTBoS). Unbeknownst to everyone, one of my primary goals for the course is to connect them with this inspiring community. And what better way to entice them than by taking these two days to show off some of the rich resources this community creates and shares freely? 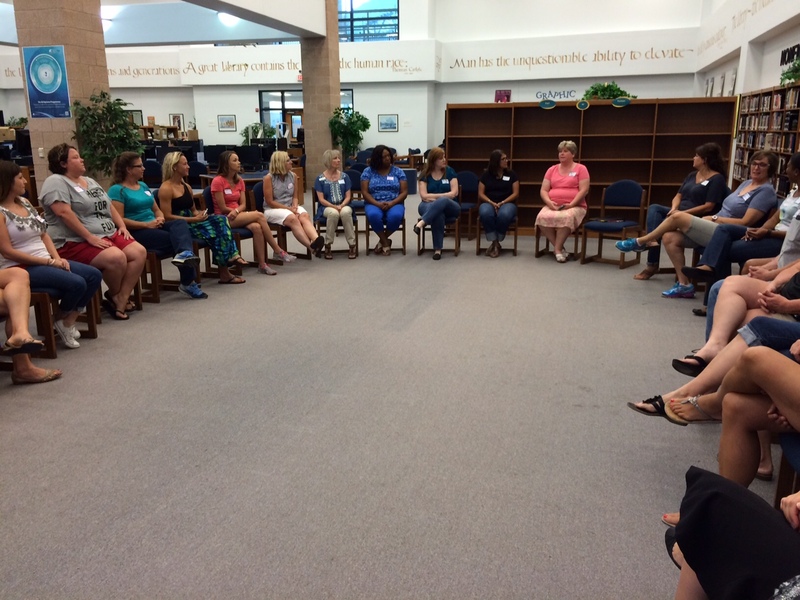 After our getting-to-know-you activity, we moved into a community circle. Regina set the tone by talking about why our district is excited about and invested in this course. Then everyone went around to introduce themselves to the group and talk a bit about why they chose to apply for the course. Their reasons varied, but there were some overriding themes. For many of us in the group, math is not a subject we loved as a kid. In fact, several folks went so far as to say they hated it growing up. On the bright side, these same folks want their students to have better experiences with math than they did. Everyone agreed that math is a rich subject, and they want their students to experience and appreciate that richness. Their stories during the community circle provided a nice segue into our next activity. 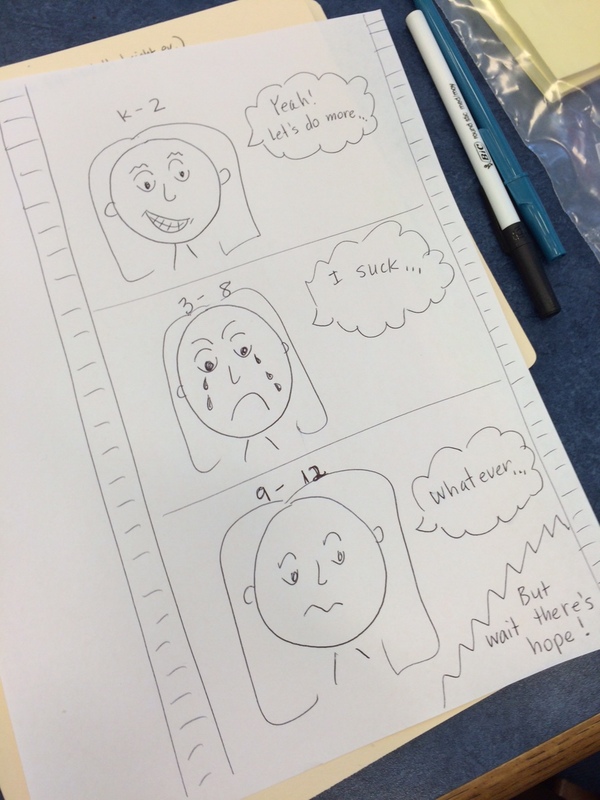 We asked the participants to reflect on their own experiences learning math. 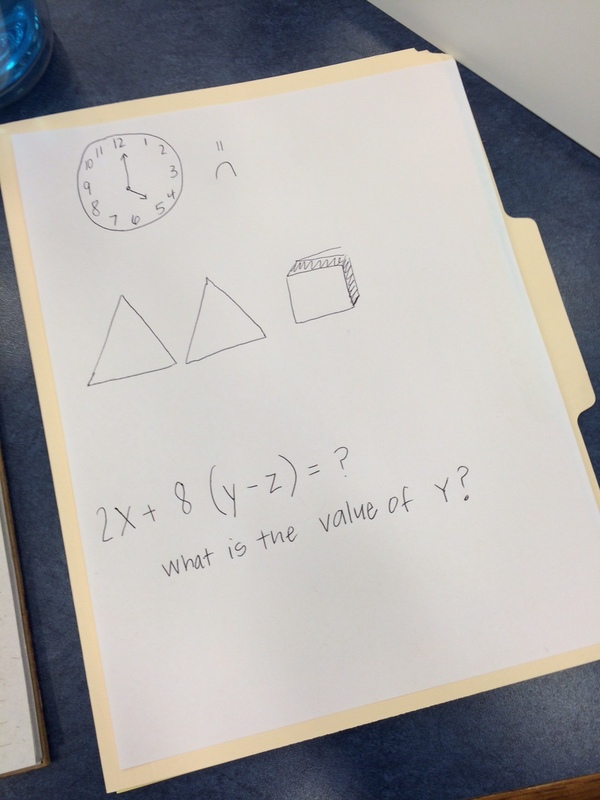 They had to choose three images that came to mind that symbolize what math was like to them as a student and sketch them on a blank sheet of paper. 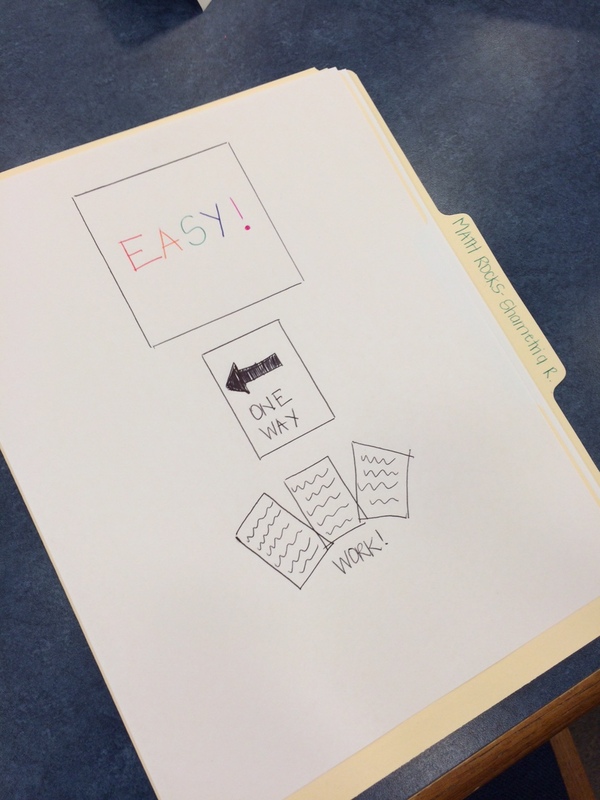 When everyone was finished, we did a gallery walk. There were a few recurring themes here as well. Many pictures showed formulas with variables. People said that they remembered being told to use these formulas because they would “work” but they never understood what they meant or why they were using them. 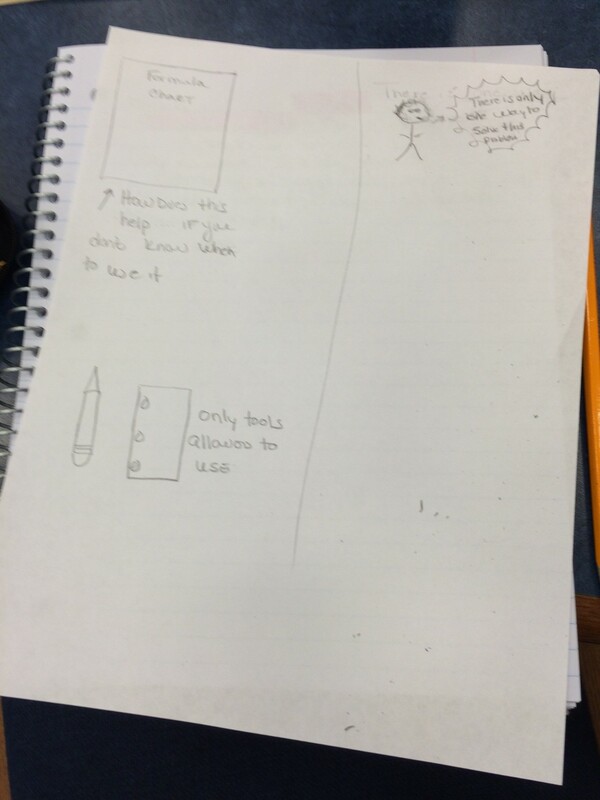 Many pictures also showed numerous worksheets, indicating that math was more about quantity of problems than quality of reasoning or understanding. For those that said they disliked math as a child, we talked about when that started happening, and the group was split over it being Algebra or Geometry. By the way, I’m sharing a lot of the negative experiences, mostly because I felt like I was hearing those most, but I do have to say that there were some voices of folks who did like math as a kid or they grew to like it as they got into higher grades. So negative stories were definitely not universal, which was encouraging. After debriefing these experiences, we watched Tracy Zager’s talk from Shadow Con 2015. This was basically a small teacher-led mini-conference in the “shadow” of NCTM Boston (hence the name). All of the talks given at Shadow Con are available on the website, along with a facilitator’s guide if you’re interested in utilizing any of the videos in your own PD. Two of the videos really struck a chord with me and ended up becoming the inspiration for our two course goals. Tracy’s video is called Breaking the Cycle. Here’s a short synopsis. I could write a whole blog post about this video and my thoughts on it, but really you should take 15 minutes and watch it for yourself. It’s powerful stuff. The majority of elementary school teachers had negative experiences as math students, and many continue to dislike or avoid mathematics as adults. We’ll look at how we can better understand and support our colleagues, so they can reframe their personal relationships with math and teach better than they were taught. 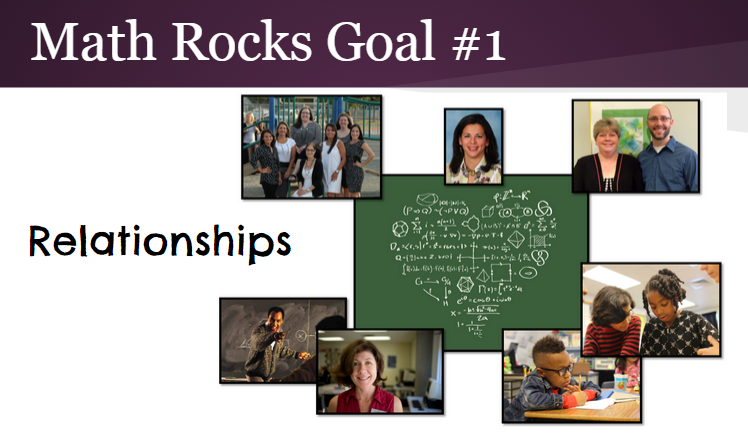 We watched the video, debriefed, and then I shared our first goal for Math Rocks: Relationships. We also want them to build their relationship and their students’ relationships with mathematics. To help them start working on this goal, we took Tracy’s call to action from the end of the video. Each participant chose a word from a word cloud that shows how mathematician’s describe math. Over the course of the next month, as they attend PD and prepare for the start of the school year, their mission is to plan for math instruction with that word as an inspiration and guide. We’ll revisit how this went when we meet back in September. And then it was time for lunch. Whew! We crammed a lot in that morning. The quarters don’t belong because they equal a whole dollar. The value of each of the other three pictures equals part of a dollar (4 cents, 5 cents, 40 cents). The quarters don’t belong because the word you say for their value (one dollar, one hundred cents) doesn’t start with “f” like in the other three pictures (four, five, and forty cents). 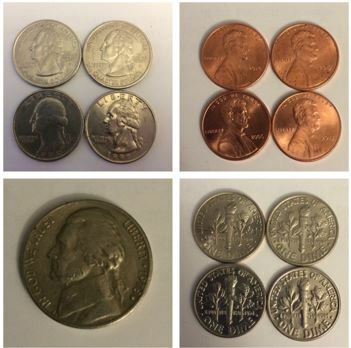 The pennies don’t belong because they are not the same color as the other coins. The pennies don’t belong because they are the only coin where the heads face right instead of left. The nickel doesn’t belong because there is only one. The dimes don’t belong because they are the only one where the tails side is showing. The dimes don’t belong because the value of a dime has a 0 in the ones place. All the other coins have some number of ones in the ones place (5 ones in 25, 1 one in 1, 5 ones in 5). Like Estimation 180, this activity was included intentionally because this is yet another FREE resource created by the MTBoS (pronounced “mit-boss”). It’s actually inspired by another FREE resource created by someone in the MTBoS, the Building Better Shapes Book by Christopher Danielson. 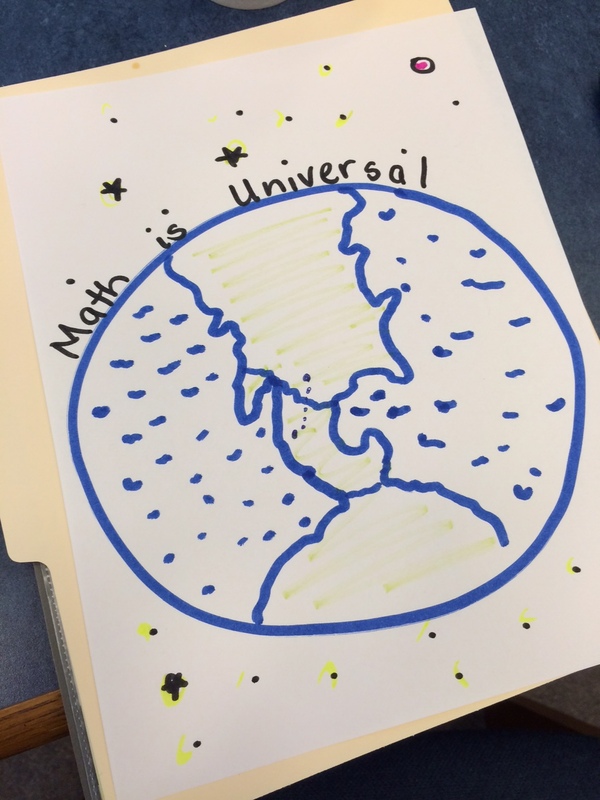 When students enter our classroom, we ask them to be genuinely curious about the material they are learning each day: curious about numbers and their properties, about mathematical relationships, about why various patterns emerge, but do we, as teachers, bring that same curiosity to our classes? Through our own curiosities, we can gain a deeper understanding of our content and learn to follow the lead of our students in building productive, engaging and safe mathematical learning experiences. As teachers, if we are as genuinely curious about our work each day as we hope the students are about theirs, awesome things happen! Again, we watched the video, debriefed, and then I shared our second goal for Math Rocks: Curiosity. We want participants to use their time in this course to get curious about mathematics, about teaching, and about their students. We also want them to find ways to spark their students’ curiosity about mathematics. When you’re curious about something, you need resources to help you resolve your curiosities. I didn’t want the folks in this course to feel like we were going to leave them hanging. That’s when I formally introduced the MTBoS. I told them the story of how I joined the MTBoS back in August 2012. (On a side note, it’s hard to believe I’m approaching my third anniversary of being part of this amazing community of educators!) This is a community that prides itself on freely sharing and supporting one another. 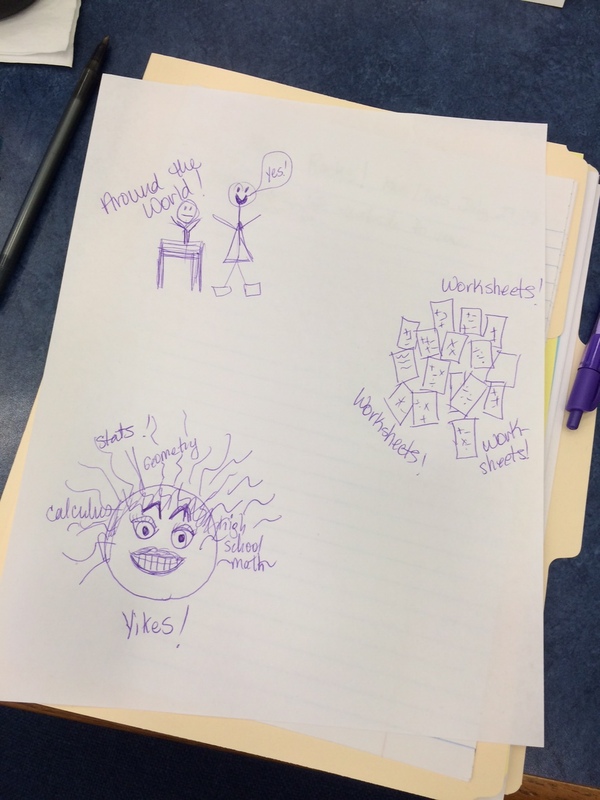 If the educators in Math Rocks really want to take their math teaching to the next level, getting connected to a network like the MTBoS is the way to go. One of the amazing things the MTBoS has done to help new members join and get started is to create Explore MTBoS. Periodically, the group kicks off an initiative to help new members start blogs and Twitter accounts. Unfortunately, there isn’t an initiative starting up right when Math Rocks is starting, so I started one up myself. I created a blog where I tailored the existing missions from Explore MTBoS to guide our group as they become members of this online PLC. We did the first two missions to wrap up the first day of Math Rocks. Each person had to make a blog and create a Twitter account. I’ll admit, I was super stoked about this, but I’ll be honest that I threw more than a few people way out of their comfort zone that afternoon. Despite that, they still made their accounts, wrote their first blog posts, and sent out their first tweets. I am so proud of them for taking these steps, and I am eager to see where it leads from here. That wraps up Day 1, our first 6 hours together. I’ll share Day 2 in another post. 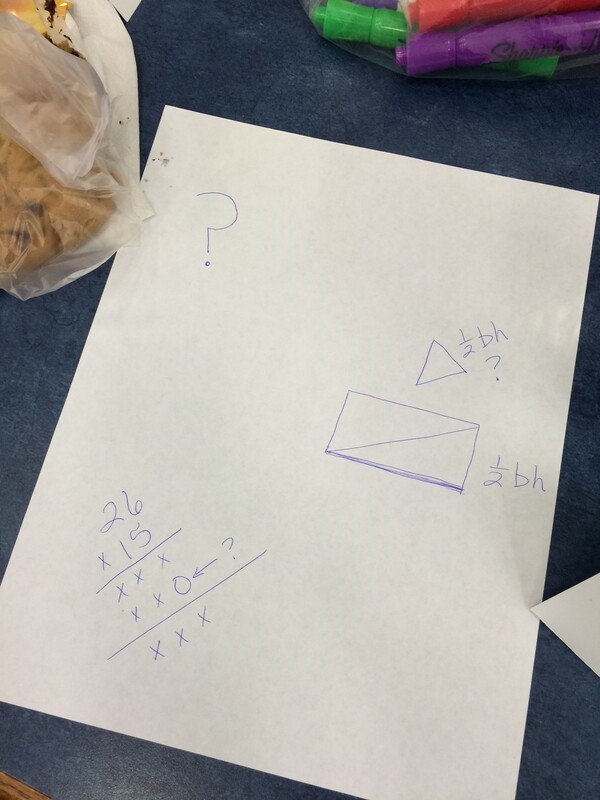 This entry was posted in Uncategorized and tagged community building, Estimation 180, ExploreMTBoS, Math Rocks, MTBoS, PD, WODB on July 28, 2015 by bstockus. As a sixth grade teacher I am always entranced by the things elementary teachers explain about how their students learn math. I learn so much about teaching children and about the human brain and the stages we all go through. I’m thrilled you’re blogging about this class and hope your teachers will blog about it and about their experiences with their students, too. I love your line, “and next thing I knew…” That’s sort of what I’m hoping for the participants in this course. By the end of the course, I’d love for them to look back and wonder how they ever taught without having a blog and/or Twitter. 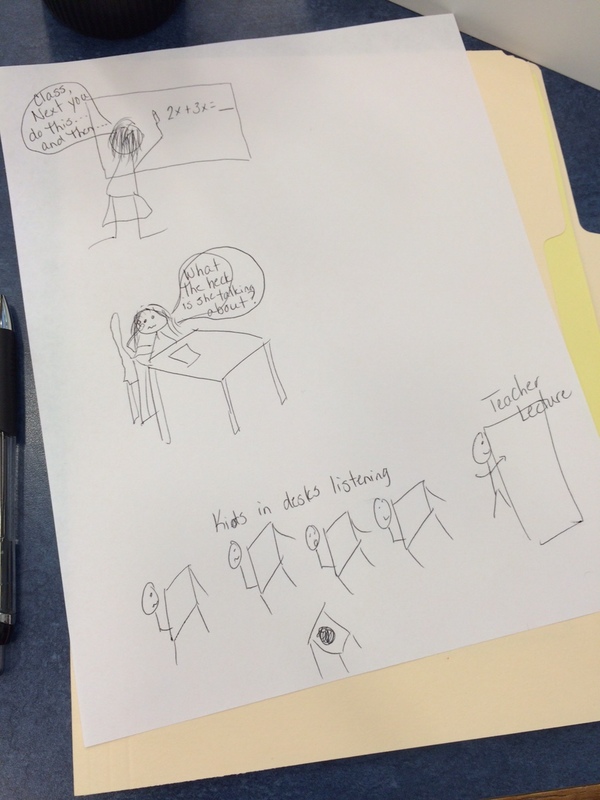 I also like what you said about being interested in what elementary teachers have to say. I’m going to share that with my group because I’m not sure they’re aware there is an audience beyond elementary teachers who’d like a peek into their classrooms. Reblogged this on Building Mathematicians. Love this Brian and am anxious to see where the rest of this PD goes. 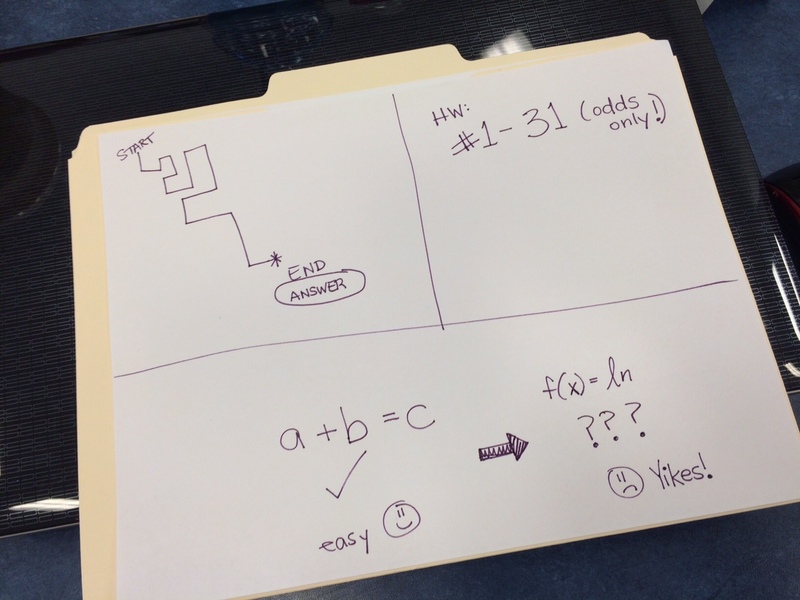 You and your colleague are creating a template for how to expose teachers to the wonders of the MTBoS, a template that others can use in their buildings and districts. I’m already stealing some of your ideas for a workshop next week. Thanks for sharing! Steal away! As you can tell, a lot of this was already cobbled together from various sources in the MTBoS. If I model nothing else for them, I want them to see how you can utilize a wealth of resources online without having to reinvent the wheel all the time. Way to set the bar for PD sessions moving forward Brian. What I really like about this workshop is that it is in the now. Your sharing resources with teachers that are happening daily in classrooms across the country and these ideas are accessible to everyone and at an affordable price (FREE). I hope teachers begin to see that they don’t need to create anything going forward. We just need to become wise consumers of math resources and that is something you have modeled beautifully here! I should have just copied and pasted what you said into my reply to Joe. You hit the nail on the head. Thank you for the support, Graham!